The constellation Reticulum. Roll mouse over to see labels. Reticulum is a small and faint southern constellation. It lies close to the south celestial pole and is circumpolar across much of the southern hemisphere, but appears highest in the evening sky in the months around November. This constellation was named by Nicolas Louis de Lacaille in 1756 to commemorate the reticle in the eyepiece of the telescope he used to measure star positions from the Cape of Good Hope in 1751–52. 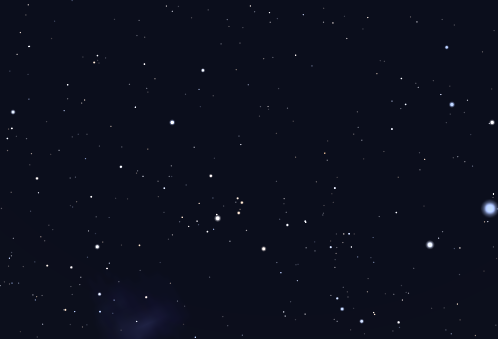 Previously this sky area was known as ‘Rhombus’ – so called because its brightest stars lie in a diamond shape. Reticulum contains only one third-magnitude star and no bright deep sky objects. 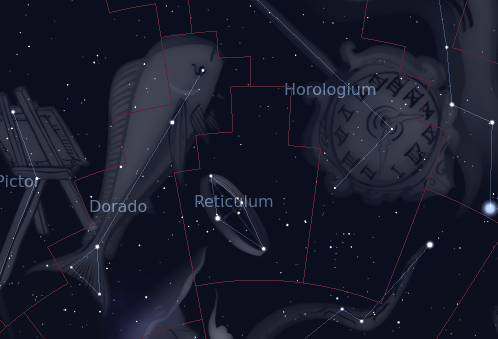 The following constellations neighbor Reticulum: Dorado, Horologium, Hydrus.